The Bristol Bulldog was a second generation post-war single-seat interceptor fighter designed to replace the Gloster Gamecock and Armstrong Whitworth Siskin. It was the most famous of the 1920s inter-war British fighters and was just one of many excellent designs of Captain F. S. Barnwell of the Bristol Aeroplane Company. The Type 105 (Bulldog) was built to meet Air Ministry specification F.9/26 for a day and night fighter and N.21/26 for the Royal navy to be powered by the Mercury engine which was then under development. The Type 107 (Bullpup) was ordered for evaluation and the Type 105 did not get official backing. Bristol was asked to revise the 105 to meet the F.20/27 specification. Mercury engines were expected to be short in supply and the 105 was developed with the Bristol Jupiter engine. While the Bullpup was still waiting for an engine, the 105 was completed and made its inaugural flight on May 17, 1927. Only a single Bullpup prototype was built, and never went into production. While the Bullpup was designed solely as an interceptor, the Bulldog was able to meet the F.9/26 specification as a day and night-fighter. In the night-fighter role, it competed against the Armstrong Whitworth Starling, the Boulton and Paul Partridge, the Gloster Goldfinch and the Hawker Hawfinch during the summer of 1927 at Martlesham. The finalists were the Hawfinch and the Bulldog and both were close in performance. In a dive with a terminal velocity of 270 mph (435 km/h), the Bulldog’s fabric covering remained intact and there were no reports of flutter or fabric distortion. The maneuverability of the Bulldog was good, but it had poor spin characteristics. The tail was enlarged to correct this, but this created problems with cross-wind landings and taxiing on the ground. A second prototype was constructed by Bristol, with a longer fuselage and the original small tail. It was designated as the Bulldog Mk. II (Type 105A, c/n 7235, s/n J9480) and flew against the Hawfinch in extended trials. It was first flown in January 21, 1928. The Bulldog never saw combat with the RAF, but during the Abyssinian crisis, Bulldogs of the No. 3 Squadron were sent to the Sudan. In 1937, they were pulled from fighter command and were replaced by the Gloster Gauntlet, but still continued service as trainers. The Bulldog served with Australia, Denmark, Estonia, Finland, Japan, Latvia, Siam and Sweden. Latvia sold eleven Bulldogs to the Basque nationalist forces and served with the Spanish Republican Air Force in the Spanish Civil War. They formed part of the so called “Krone Circus” that specialized in strafing the Western front lines. Ten Bulldogs also saw combat as part of the Finnish Air Force during the Winter War against the Soviet Union. In 1939, three Bulldog IIAs were sent to Finland as advanced trainers and were used against the Soviet Union during the Continuation War from 1941 to 1944. A Bristol Bulldog IIA in Swedish Markings. The Bulldog Mk. IIA had a revised wing spar and ailerons, plus many more modifications. It was powered by a Jupiter VIIF engine. A contract for 92 aircraft was awarded in May 1930 to meet Specification F.11/29. Most of the aircraft went to Nos. 54 and 111 Squadrons at Hornchurch and No. 32 Squadron at Kenley. A total of 100 Bulldog Mk. IIAs were built and 8 aircraft went to the Swedish Air Force. In Australia, eight Bulldog IIs arrived in February 1930 at SS Fordsdale and acceptance tests were carried out at Point Cook in May. On May 9th, Flying Officer C. Henry won the Victorian Aerial Derby flying at 183 mph (295 km/h), and a few days later, Flying Officer W. G. Rae escaped by parachute after a Bulldog wing failure, while performing an outside loop. The Bulldog soon became a favorite at air shows, where Flight Lieutenant F.R. Schergerits performed demonstrations. He later became the RAAF Chief of Air Staff. During the early thirties, the Bulldogs formed the fighter squadron at Point Cook. 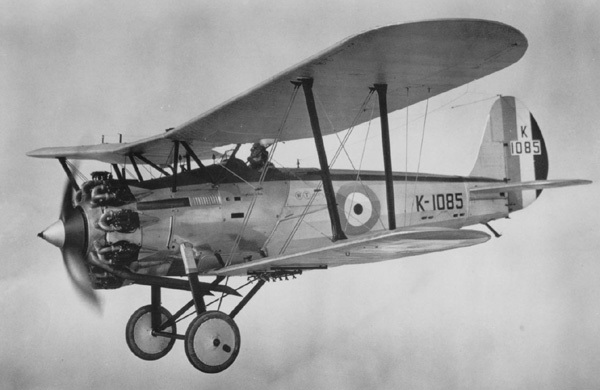 In March 1932, a flight of Bulldogs flew to Darwin to coordinate with the RAF flying boats of No. 205 Squadron from Singapore. In 1940, the three surviving RAAF Bulldogs were converted to instructional airframes, and were scrapped during World War II. The lower wing of the Bulldog was of both a shorter span and chord for the purposes of giving better downward visibility to the pilot. This concept originated with the Albatross D.III and Nieuport designs of World War I. Wind tunnel test also showed advantages with this arrangement and it was also discovered that different airfoils could also be incorporated to change flight characteristics. The upper section was a special section called the Bristol IA, developed by Bristol’s Chief Aerodynamicist L. G. Frise and the Royal Aircraft Establishment. The lower airfoil was a Clark YH design which was popular with flying model makers, but with a reflex trailing edge.6 (A wing where the camber line curves back up near the trailing edge is referred to as a reflexed camber airfoil.) Frise-type ailerons were installed on the upper wing only and both wings had five degrees of dihedral. (The leading edge of Frise type ailerons is hinged aft of the aileron leading edge and protrudes below the wing when the aileron is deflected upward. This design helps provide aerodynamic balance.) The wing arrangement worked well as far as lift/drag characteristics were concerned, but spin recovery was difficult which was corrected by lengthening the fuselage on the Bulldog Mk. II. Metal frames were rapidly replacing wooden frames structures and became an Air Ministry requirement after 1926. Bristol used high tensile strength steel strips that were rolled and riveted to form long longerons and struts. The joints were attached with gusset plates to avoid the high cost of machined end-fittings. Light alloys with Alclad (aluminum) coatings allowed for stressed skin construction. Baked enamel coatings were used for corrosion protection of internal fittings. In later years, Alclad and baked enamel coatings would be replaced with anodizing. Anodizing was used extensively on the Boeing Model 247. Two Vickers guns were mounted in the cockpit which had to be accessible to the pilot in case the guns jammed. 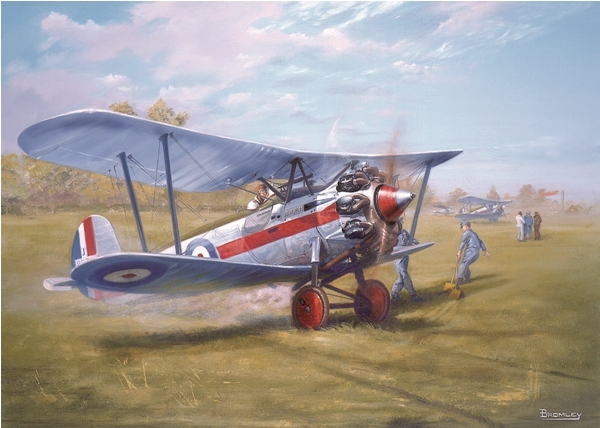 The Vickers was noted for jamming and sometimes the pilot would carry a mallet along to whack the guns back into action.7 A short wave radio was also installed just aft of the cockpit. The Bristol Bulldog was one of the finest acrobatic planes ever built. It was often put on display and performed spectacular aerobatics during airshows at Hendon where formation teams exhibited different colored smoke trails. 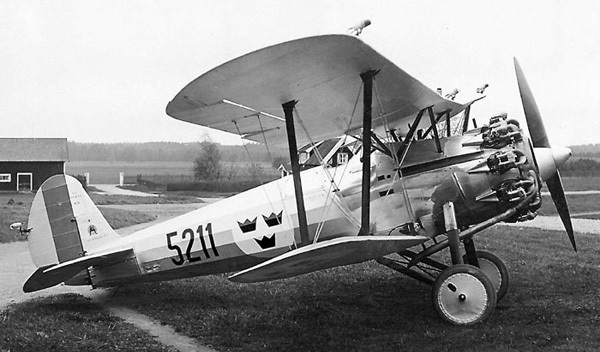 Although its battle arena was limited to the Finnish arena, the Bulldog was one of the greatest fighters of the biplane era. A total of 443 aircraft were built for the RAF other operators. Two fuselage Vickers .303 machine guns. 1. C. F. Andrews. Aircraft in Profile; Volume 1, The Bristol Bulldog, No. 6. Garden City, New York: Doubleday & Company, Inc., 1965. 3. 2. Kenneth Munson. Fighters Between the Wars 1919-39. New York: MacMillan Publishing Co., Inc., 1970. 133. 3. C. H. Barnes. Bristol Aircraft Since 1910. Fallbrook, California: Aero Publishers Inc., 1965. 214. 4. Herschel Smith. A History of Aircraft Piston Engines. Manhattan, Kansas: Sunflower University Press, 1993. 131. 5. C. H. Barnes. 215. 6. The Bulldog IIA Aeroplane Jupiter VIIF or VIIF.P Engine. London: His Majesty's Stationery Office, Air Publication 1393. May, 1932. 8. Owen Thetford. Aircraft of the Royal Air Force since 1918. New York: Funk & Wagnalls, 1968. 112. Created November 10, 2014. Updated October 31, 2016.